Check out Now I Feel Better About my Summer Job on Part Time Perfectionist. This blog is now at timberry.bplans.com. Please join me there. 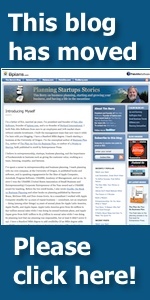 If you've subscribed to this blog at timberry.typepad.com, please resubscribe at the new site. Thanks, Tim. and is due soon at Borders. Marketing Plan Pro 11.0 powered by Duct Tape Marketing is simple, practical marketing plan software that makes it easy to plan and carry out the marketing activities you need to grow your business.